The mass killings in Norway have caused recriminations on both sides of the U.S. ideological divide. Some observers have highlighted Anders Behring Breivik’s keen interest in American anti-Muslim bloggers like Pamela Geller, Daniel Pipes, Robert Spencer, and Andrew McCarthy. These writers and other purveyors of anti-Muslim paranoia are scrambling to deny or minimize their culpability. Most notably, the Rupert Murdoch papers in Britain have insisted on labeling Breivik a neo-Nazi, in spite of his avowed identification with the militarist Israeli right. But the blame game seriously misses the point. There is no denying that Breivik’s manifesto and beliefs are rooted in a distinctly post-9/11 ideology of anti-Islamism. This relatively new ideology of anti-Islamism reveals much about the deeper pathologies in current U.S. politics. Critics have also lambasted efforts by some U.S. media outlets to label Breivik a “Christian fundamentalist.” This is a vitally important point to understanding the larger pathology of anti-Islamism. Whereas those who traditionally speak of a “clash of civilizations” refer to a struggle between the “Judeo-Christian West” and “Islam,” the anti-Islamism circulating through the “West” is neither historically Jewish nor Christian. Rather, it is best understood as what the neocon propagandist David Gelernter calls “Americanism: The Fourth Great Western Religion,” with the other three being Judaism, Catholicism, and Protestantism—pointedly excluding Islam. The episode that revealed the new anti-Islamism in all its ugliness was last year’s chorus of opposition to the construction of a Muslim community center two blocks from the World Trade Center site. Notorious right-winger Pamela Geller’s crusade against the center was a clarion call for anti-Islamism—indeed, Geller pervasively influenced Anders Breivik’s screeds. Opponents of the proposed Muslim center claimed the site is “sacred ground,” revealing again the paranoid style of anti-Islamism. This is a direct analogy to the Klan’s priestly vestments—“Ground Zero” is the holiest site in Gelernter’s “fourth great western religion,” which non-believers are not fit to desecrate by their presence. For media liberals and others to smugly ascribe this paranoid style as the province of the nationalist right is therefore dubious at best, and arguably a deliberate avoidance of the more disturbing questions it raises. The U.S. media is complicit in the belief that “the world” is “at war” with some kind of global Islamist conspiracy against all that is right and true. Coverage of the Norway attacks proved the media’s inherent bias—witness the conflation of the word “terrorism” with an Islamic conspiracy. There is one commonality in the paranoid style that Hofstadter’s theory misses, but which Peter Beinart prominently recognized during last year’s Manhattan mosque controversy. Beinart observed that both McCarthyism and the 1920s Klan emerged at times when the United States was confronted with the limits of its power in the world—during the Korean War and the aftermath of World War I, respectively. 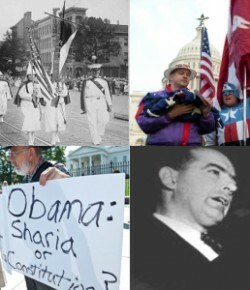 Moreover, both emerged when the problems they were ostensibly addressing were already largely resolved: the 1920s Klan emerged as Catholic and Jewish immigration was slowing down and the immigrant communities were integrating into U.S. society, and McCarthy only emerged on the national stage when the U.S. Communist Party had already entered irreversible decline. Likewise, as the United States is just beginning to confront the abject failure of its so called “war on terrorism,” a large section of the U.S. public is overwhelmed with anxiety over the fact that September 11, 2001 was not, after all, the day that “changed everything.” Indeed, the most often heard grievance of the Tea Party movement is that there is a war on their sacred shibboleth of “American exceptionalism,” and this rather than either racism or concern about the national debt, is what is at the core of the movement. The Tea Party and anti-Islamists draw on the narratives of fear and conceit fostered by the U.S. media. If we want to know what created Anders Breivik, we must look beyond the anti-Muslim bloggers who schooled him, and begin to ask what in U.S. politics and society has enabled those purveyors of hate and paranoia in the first place. Jack Ross, a contributor to Right Web (https://rightweb.irc-online.org/), is the author of Rabbi Outcast: Elmer Berger and American Jewish Anti-Zionism and presently at work on a complete history of the Socialist Party of America. Eleanor Kilroy, “Right wing seeks to paint Breivik as neo-Nazi so as to disguise the truth, of shared beliefs” http://mondoweiss.net/2011/07/right-wing-seeks-to-paint-breivik-as-neo-nazi-so-as-to-disguise-the-truth-of-shared-beliefs.html. Massimo Introvigne, “Norway's Anders Breivik is not a Christian fundamentalist” http://www.energypublisher.com/article.asp?id=57706. David Gordon, “Are Americans the Chosen People?” http://mises.org/daily/2659/Are-Americans-the-Chosen-Peopleu. Glenn Greenwald, “The Omnipotence of Al Qaeda and the meaninglessness of ‘Terrorism’”, http://www.salon.com/news/opinion/glenn_greenwald/2011/07/23/nyt/index.html. Lee Siegel, “Who’s Left? Who’s Right? Who Cares?”, http://archives.econ.utah.edu/archives/marxism/2010w19/msg00188.html. Peter Beinart, “The New McCarthyism”, http://www.thedailybeast.com/articles/2010/09/12/new-mccarthyism-palin-gingrich-and-us-paranoid-politics.html.